The origins of Ferrocarrils de la Generalitat de Catalunya (Catalan Government Railways - FGC) are very close to the beginning of railway transport in Spain. 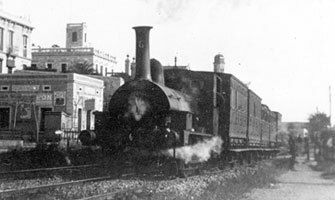 The first application for the construction of a railway between Barcelona and Sarrià was filed in 1851, three years after the opening of the first railway line connecting Barcelona and Mataró. The Sarrià train began its history in 1863, the same year as the London Underground. It was a short line, only 4.6km in length, constructed using the Iberian gauge of 1,672mm, which started where what today is known as Plaça de Catalunya, at that time outside the city, and crossed the Barcelona plain passing through the villages of Gràcia and Sant Gervasi to arrive in Sarrià, at the foot of Collserola mountain. The new railway was in response to the communication needs of the villages around the city of Barcelona. It was a key factor in the urban development of the suburbs when Barcelona began to expand over the plain under the guidance of the pioneer urban planning project inspired by the engineer Ildefons Cerdà. This means this train line can be considered one of the first urban railways in Europe. For several decades, the trains of the Sarrià line were operated by steam locomotives pulling wooden carriages, but in the twentieth century, with the gradual development of the Eixample district, the old train became anachronistic. In 1905 the company decided to go ahead with an in-depth reformation. The tracks were changed to the international gauge of 1,435mm and, in turn, steam was replaced by electricity. The Sarrià train became the first electric railway in Catalonia. By 1907 the progressive growth of Barcelona led to the absorption of surrounding villages and made it possible to extend the Sarrià railway with a new branch line from Tres Torres which went directly to the foot of Collserola Mountain, where it connected with the Vallvidrera funicular railway opened by the same company in 1906. The conversion of the Sarrià train into the suburban network as it is known today began in 1912, when the engineer Carles Emili Montañés demonstrated the need and viability of a means of communication between Barcelona and the Vallès region. In partnership with Frederick Stark Pearson, in 1912 they founded the "Compañía de los Ferrocarriles de Cataluña" (Catalan railway company) which began excavating the tunnel under Collserola mountain to enable extending the urban network towards the cities of Terrassa and Sabadell. 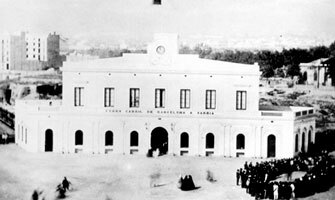 Barcelona station of the "Ferro Carril de Barcelona a Sarriá", shortly after 1863, located on the start of Pelayo Street, corner that, over time, became the Pl. Catalonia 1. Bonanova station around 1890, shortly after its opening in 1887. The train of 5 cars 1st, 2nd and 3rd class just left the station from Barcelona and goes towards Sarrià. 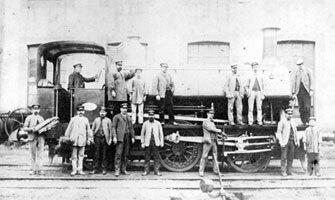 Locomotive number 9 at the Sarrià workshop, probably around 1890. This locomotive was built by Sharp Stewart & Manchester, from Great Britain, in 1876, and served until the electrification of the line.